My grandparents were discriminated against when they arrived and it was because of their race and language so they stuck together. But they looked down on anyone with darker skin – as did the Irish, the Germans, Italians, the Hispanics, the Greeks and Russians and so on. Alas, from the vantage point of Black Americans, there was no “other” to look down on for reasons of race. Even Jews, who might easily be second in the “who’s had it worst” contest, have been envied their money and creativity and, since WW2 at least, the power of their ethnic bonds. Not so the Black-American – and it’s for reason of skin color. That’s what this book is about. And although it’s mostly a wonderful story, well told – there is this very serious theme running through it which is sometimes hard to read but which is why I rated it a 9 – I would have given it a 10 but it’s really too new on the market to do that – we’ll see how it stands the test of time. The opening chapter deals with Ifemelu, a young, well-educated, professional woman who immigrated to the US 13 years prior but has now decided to break up with her long-term boyfriend and move back to Nigeria where he still lives. As an immigrant African, she’s never really felt a “part of” America although she is the author of a blog popular with a certain group – some of her entry titles are included in the narrative with great effect. There is a wonderful scene of Ifemelu at a braiding hair salon outside Princeton. Also Part 1 but Chapter 2 concerns the present day life of Ifemelu’s old boyfriend, Obinze Mbadiwe, who is back in Nigeria, married with children, and becoming quite successful in a very corrupt business as well as in society and the political regime. We like him though, because his conscience bothers him – he’d rather be a teacher. And he’s good to his wife – so far – but Ifemelu is coming – tension there. 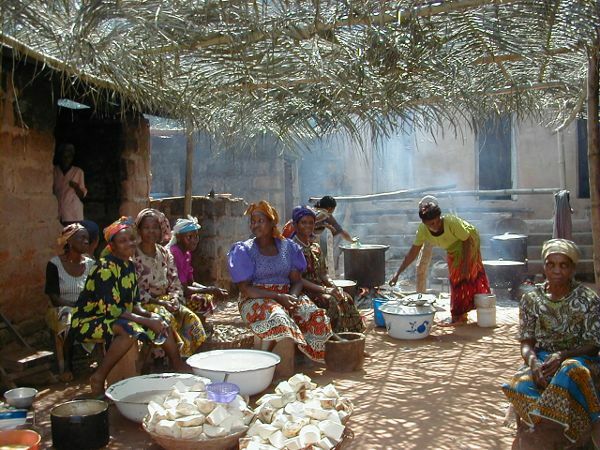 Garri – tapioca-like product from casava fibers- used to thicken or make fried snacks. Indomie noodles – packaged instant noodles – a take-off of the real thing but Ifemelu is referring to the packaged variety. One interesting character in the book is Aunty Uju, Ifemelu’s father’s sister, a village woman who moved to the city, was educated as a doctor, befriended “The General,” got a highly paid job at the hospital (which doesn’t pay her) and now moves in the top circles of her community (except The General’s wife and children live in Abuja). Aunty Ubu becomes Ifemubu’s confidant and advisor. She lives in luxury in a large home with servants and very nice things. She brings Ifemubu’s family things like new TV sets she “doesn’t need.” (But she doesn’ t have her own money – all she has is directly from The General.) Of course she loses her favored status and moves to America to become a doctor there. Ifemelu goes to the hair salon with Aunty Ubu where the “haughty hairdressers sized up each customer, eyes swinging from head to shoes, to decide how much attention she was worth.” They faun over Aunty Ubu. And she gets her immigration papers – she is now a college graduate with a fellowship to Princeton. The plan is that Obinze will join her in a few years. But Aunty Uju helps Ifemelu a bit (not much) with a place to stay and a fake ID so she can work. Another friend helps – Obinze has sent her money. Ifemelu’s bills, including tuition, go unpaid but somehow she manages for awhile but then somehow sinks to what she considers an incident of prostitution. Depression ensues and this results in the break from Obinze and his family. This was truly very difficult to read. Ifemelu finally gets a job babysitting the spoiled children of a wealthy couple for $250 a month. She and the insecure mother of these children, Kimberly, become good friends. The other sister, Laura, is decidedly unfriendly. But Ifemelu can now pay her tuition and some bills, can even move into a very small studio of her own (she is getting a small scholarship type funding). Many of the American characters seem like “types” – probably okay if this book is seen as satire and I really think it ought to be – it’s not funny satire, Adichie goes a bit further under the masks than that, although it’s fairly subtle. There are many “types” of racism and many aspects to it. Kimberly is the do-gooder type, Laura the skeptical. Finally in this central story, Ifemubu meets Blaine, the African-American assistant professor. She’s totally blown away. The last section of Chapter 17 includes a blog entry which is really quiet amusing and although a bit generalized (she’s entitled, I guess, like everyone), it’s spot-on. But Brian goes nowhere (although you know he eventually will because it’s been foreshadowed). And she meets Curt, a rich white charmer who loves her completely – I think – but again, she doesn’t fit in his world – she’s accepted in way, but not in a way that truly fits – it’s “their” world, not hers. Ifemelu changes her accent and her hair – but there’s still no fit – not with African-Americans and not with American-Africans. She joins different groups at school but there is no real mesh and I’m not sure why – too ideological? Ifemubu is having an identity crisis. Will Ifemelu find a home with a sense of belonging? Can it be with Obinze back in Nigeria? This is where she’s headed according to the frame story. And so she goes back to Nigeria where she eventually contacts the married Obinze and they begin an illicit relationship. He doesn’t feel like he fits in his marriage but is torn – she wants him to be free. Here she is once again the outsider, but it’s a bit different because she really is free and he’s not. It’s rather similar to their situations as immigrants – he was illegally in another country while she got her papers and did it right. He was deported and eventually did well – she stayed, never really fit and eventually wanted to go back to Nigeria. And so they break up because he’s not free although in the end he does free himself, for himself not for her, and she lets him in again. They have done what they’ve needed to do essentially for themselves, but they found their way back to each other and to Nigeria where they both fit from the beginning. Nice ending. belonging and identity in lots and lots of manifestations but especially in regards to race and homeland. Thank you – I was very confused about the spelling and even when I checked it seemed to change every time. I think I got the errors corrected. Thank you, it was an excellent book. Becky Lindroos, this is a very nice summary of AMERICANAH, your insights on the teaching profession were particularly helpful. 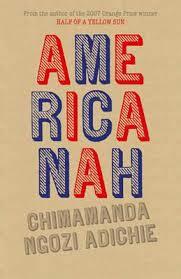 Don’t let it’s newness in the marketplace dissuade you from giving it a “10” if you think AMERICANAH deserves it! Thank you. I certainly did enjoy the book. It made my personal to 10 of 2013 list. Should have said “top” 10. Becky Lindroos, just got my copy from the library, today, and am looking forward to getting my AMERICANAH, on! I’m posting on the AMERICANAH movie adaptation on moviepilot.com, and welcome any further insights that you might have! Happy Saturday! I look forward to seeing the movie and you review! Becky Lindroos, as you know, Lupita Nyong’o purchased the book rights on May 30th 2014, so the earlest the movie will be made would be 2015. My moviepilot.com postings concern proposed casting for the movie in which Nyong’o will, obviously, play Ifemelu. As Barbra Streisand bought the rights to YENTL in 1974 but did not make the movie until 1983. Obviously, avoiding a long delay in producing AMERICANAH is the goal! Do you have or do you know where i can find a complete character list for Americanah I am trying to make a study guide? Oh that would be a very good thing but I have no idea where to find one. I often do character lists but for some reason didn’t with Americanah – too much else to say, I guess. Good luck. How is the personal and social life separate from formal education as the book suggests? That’s a very interesting question (sounds like a school project), but it’s been more than a year since I read the book and I’d have to go back and reread it for the specifics. Having little time I can only suggest you examine the formal education experiences of both Ifemelu and Obinze in both Africa and the US and compare that to the extensive narrative about their lives on the personal and social level. Hi, Does she deal with weight issues in the book? I have no idea – it’s possible – been a long time since I read it. Well I’m delighted you enjoyed the book. I think the ending is left rather open – we each create our own but it’s better if we’re really free to do it – not already married or with unfinished business from prior pieces of our lives. That’s why I thought it was a nice ending.